Thirty Eighth Street has looked high and low for some amazing inspirational upholstery makeovers and boy have we come up with a great list to get you motivated! Let's face it- reupholstering a sofa or a chair takes patience, talent and can sometimes cost a hefty price. What if I told you that you could give your piece of furniture a face lift without pulling your hair out or emptying your pocket book? Did you know that you can use paint to cover an outdated used piece of upholstered furniture and make it look fresh and new again? Would you like to know the best part? If your darling two year old spills grape juice on your freshly painted chair, you can sanitize the stain and using your left over paint, and simply paint right over the spot. An inexpensive solution to fix those accidents over hiring a service to come out and treat them! 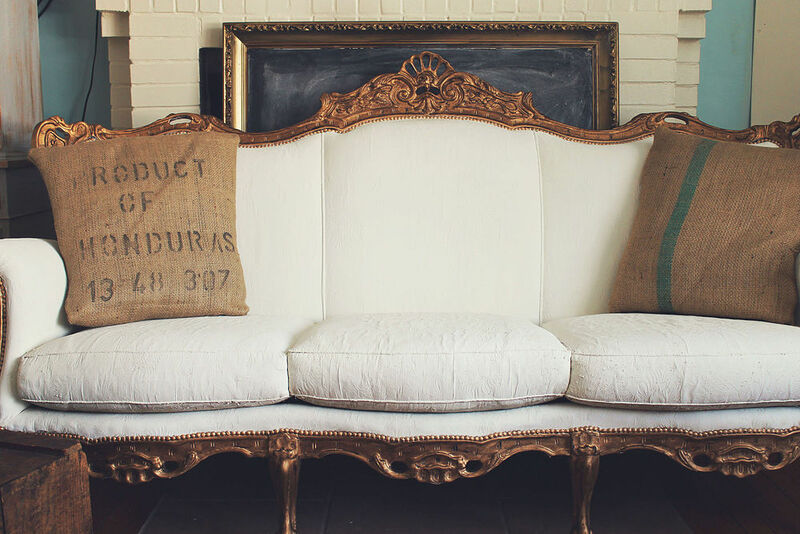 Would you like to see some jaw-dropping painted upholstery transformations that don't necessarily look painted? Hope on over to Thirty Eighth Street's Hometalk Board to see the complete list of amazing makeovers. We'll highlight a few of our favorites here! What could you do with some painters tape, a ruler and some paint? 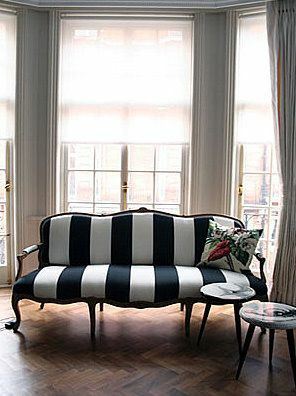 Give your room a bold focal point by painting stripes on your sofa! Or go in the opposite direction and give an obnoxious patterned piece some calm and serenity by painting your upholstery a clean, light hue. We personally love Trois Petites Filles design choice to pair a gold frame with this neutral palette. We attempted our own painted upholstery projects here and here using Chalk Paint® decorative paint by Annie Sloan. 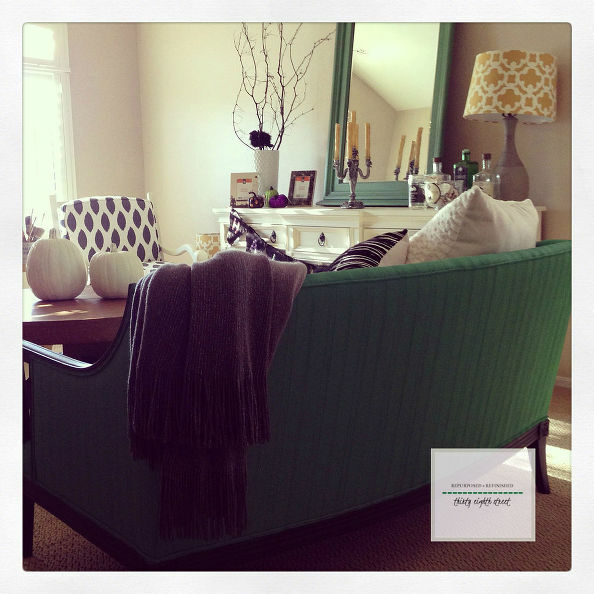 We selected a bold custom emerald green color to add a pop of color to our space. And no, we've never received a green bum-bum. ;) After 2 1/2 year, it's still holding strong! You can paint vinyl! Wouldn't this look amazing in a vintage style boy's room? Turn your grandfather's heirlooms into an amazing statement piece. 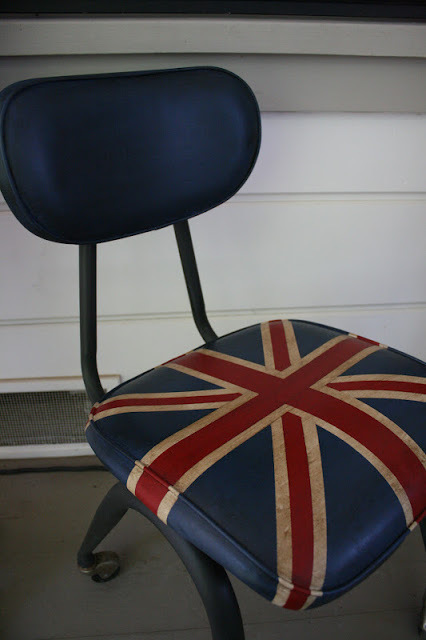 We sure think Reloved Rubbish nailed it with their Union Jack Vinyl Chair. 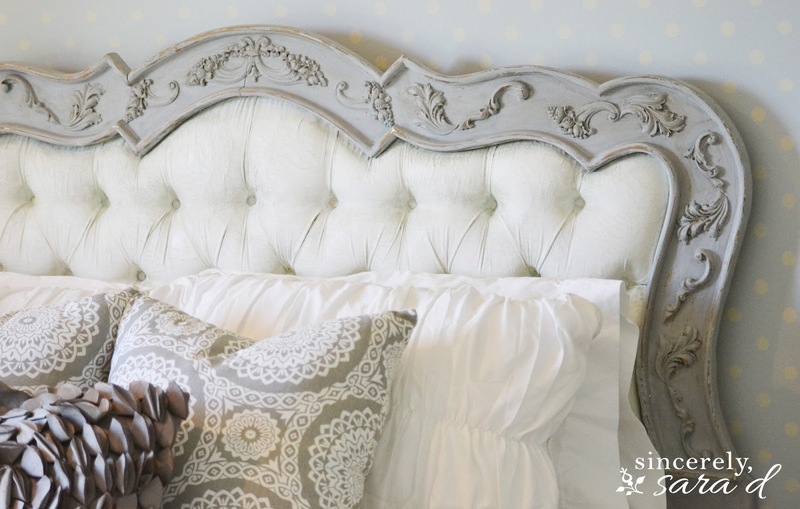 And finally, we love that Sincerely Sara D. took this upholstered headboard and transformed it into a tranquil retreat. 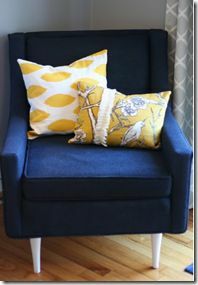 Image Courtesy: sincerely sara d.
To view all twenty-two fabulous painted upholstery projects and to get the skinny on these amazing makeovers, visit us over at Hometalk!